We’re now six weeks away from the release of Avengers: Infinity War, which was recently moved up at the behest of Iron Man. Marvel’s fresh out of teasers and trailers, having hyped the third Avengers film for what feels like infinity. Presumably, all the studio has left to fan the flames of the geeky masses at this point are promotional stills, which don’t sound all that exciting. That is, until you realize that it’s another smoldering, class picture of the many good-looking people that inhabit the Marvel Cinematic Universe. Then it’s totally okay. Total Film posted the photo, which MCU mainstay Chris Evans promptly shared. 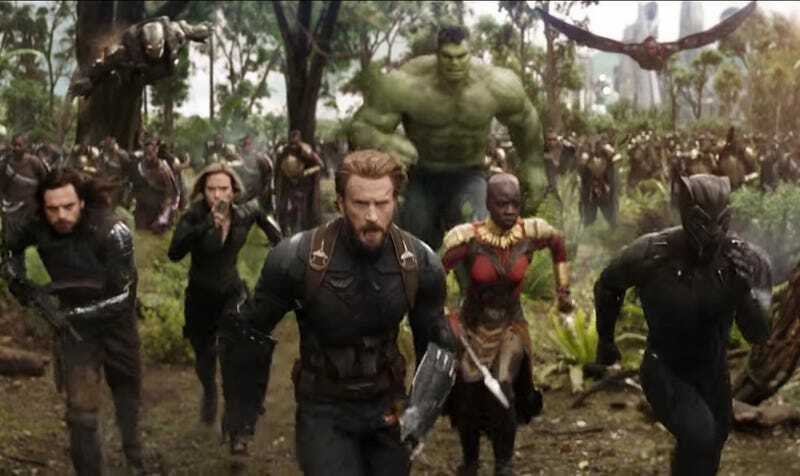 It shows the Captain America actor alongside Black Panther’s Chadwick Boseman and Danai Gurira, as well as his old buddies Scarlett Johansson and Sebastian Stan. If you’ve seen Black Panther (and if not, why not? ), then you’ll recognize the savannas of Wakanda, which have featured prominently in the new movie’s previews. Why is T’Challa’s kingdom one of the battlegrounds for the upcoming Infinity War? We won’t really know until April 27, when the movie hits theaters, but we have some theories.